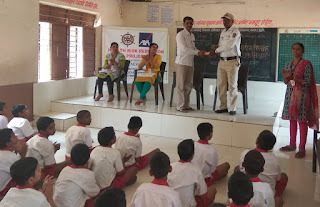 13-Mar-2018, Chinchwad (Pune): The Don Bosco Development Society (DBDS), Chinchwad organized an interactive session on ‘Road Safety and Traffic Rules’ for the children in the Mata Ramabai Ambedkar School in Ajantha Nagar slum of Pune. 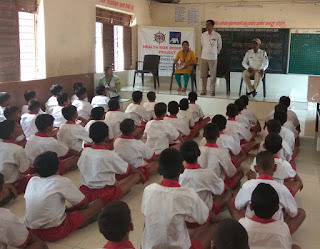 64 Children participated in this session held under the aegis of ‘Health Risk Reduction’ project supported by AXA Business Services Ltd.
Mr. Suresh H. Kamble (Traffic Police department) was the resource person for this session. 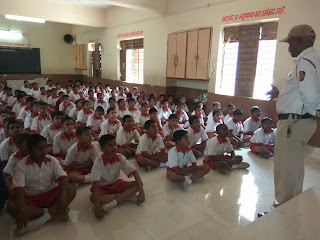 In his talk he covered various DO’s and DON’Ts related to road safety. 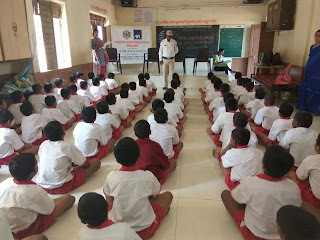 He also educated children on helping victims of road accidents. In case of accidents always call police by dialing numbers: 100 & 103. 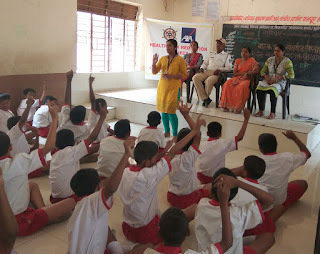 Then Ms. Lalita Chaudhari (DBDS - Coordinator) spoke about Grahak Manch. 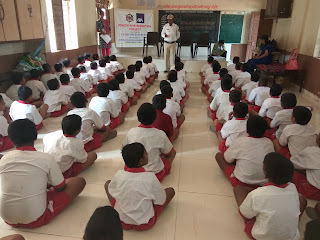 Snacks were served to all the children.